The yellow band that stretches around the top of a hoiho’s head and into its eyes marks it as one of the world’s rarest penguins, and a breed unique to New Zealand. Hoiho translates to ‘the noise shouter’, the name given because of the birds’ shrill calls. In early summer, its crop bulging with fish and squid, the yellow-eyed penguin needs a quiet, clear path home, hungry chicks are waiting. There’s no time for the preening and socialising that may happen at other times of the year. 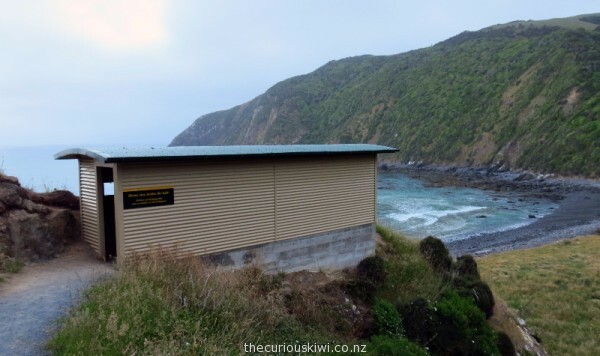 To keep distractions to a minimum, people are asked to keep off the beach after 3pm, and to stay inside the corrugated iron viewing hide. The viewing hide sits up off the beach, concreted into the hillside and partially hidden by rocks. We knelt in the crowded hide surrounded by visitors from foreign lands, some speaking in whispers we didn’t understand. No matter, when it counted, the pointed finger said everything we needed to hear. 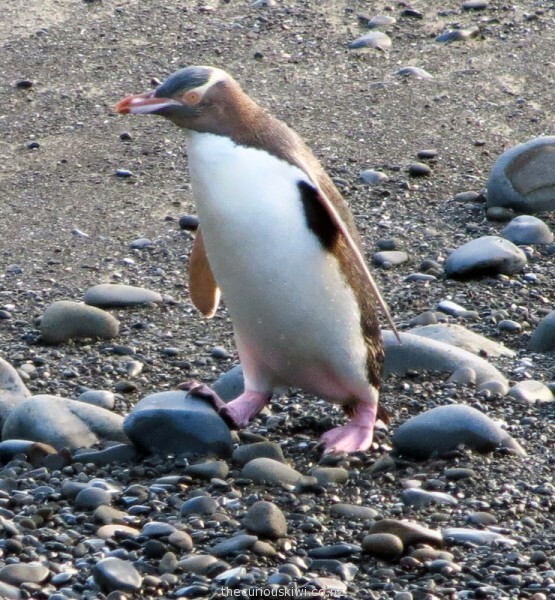 In 90 minutes we saw four yellow-eyed penguins wash ashore onto slate coloured sand. Like a person rising from a good night’s sleep, a penguin stands up on its pink feet and stretches its flipper like arms. With a quick shake of its tail feathers and an even more vigorous shake of its head, the penguin is ready to climb over the stones and make its way home. 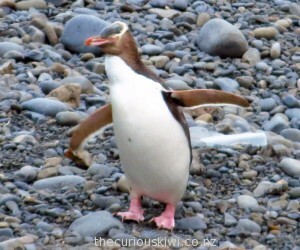 One penguin was heading home when an eagle eyed bird watcher pointed to a rabbit nearby. I had the lens focused on the penguin, but soon enough the rabbit hopped into view. Would there be a duel? The weapons: hind legs of a rabbit versus sharp claws and pointy bill of a penguin. No duel, neither bird nor animal seemed bothered. The penguin continued on its way and the rabbit hopped after it into the undergrowth, only Alice knows what happened from there. Shortly after, three tourists arrived and asked to look at our photos. When they wanted to photograph our best shot I thought they were joking, no, they were just impatient. A few minutes later they were gone, our image in their pocket, their penguin viewing done on a screen. 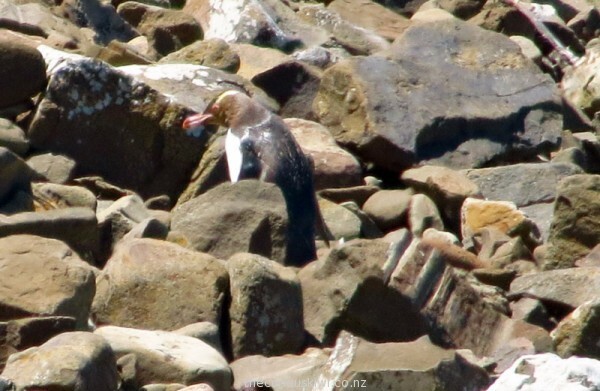 You don’t always need patience for yellow-eyed penguin spotting though. A day earlier, at Curio Bay, we were looking at the embedded remains of an ancient forest turned to stone, known as the Curio Bay Petrified Forest. A little head bobbing through rocks in the distance caught my eye, attention turned from petrified wood to another rare sight, a hoiho making its way home. For no reason other than habit, I looked at my watch, it was just after 2pm. Late afternoon / early evening is the best time to see penguins come in from the sea, but at Curio Bay expect to see the unusual, and maybe, the unexpected. *Roaring Bay is 8km from the settlement of Kaka Point (at the Balclutha end of the Catlins). From the Roaring Bay penguin hide it’s a short walk up hill to Nugget Point Lighthouse and the nugget shaped rocks that gave the area its name. Binoculars are handy if you have them, for the penguins, and to see fur seals on the rocks around Nugget Point. There is a platform above the beach in Curio Bay for penguin viewing. The petrified forest is best viewed at low tide, if you visit at high tide, petrified stumps of wood can be seen in Waikawa, next to the Blue Cod Blues fish ‘n’ chip caravan. In nearby Porpoise Bay (see link above) you might be lucky to spot Hector’s dolphins. (Curio Bay is at the Fortrose end of the Catlins). The yellow-eyed penguin is the fourth largest of the world’s penguins. The distinctive band of yellow feathers and the yellow eyes of the hoiho don’t appear until the penguins are about 16 months old and moult into adult plumage. Many other breeds of penguin spend their non breeding season at sea, the adult hoiho lives on its breeding ground all year. A penguin’s coat is replaced once a year when they moult. Only around 15% of yellow-eyed penguins will survive until breeding age (2-3 years for females, 3-5 years for males). 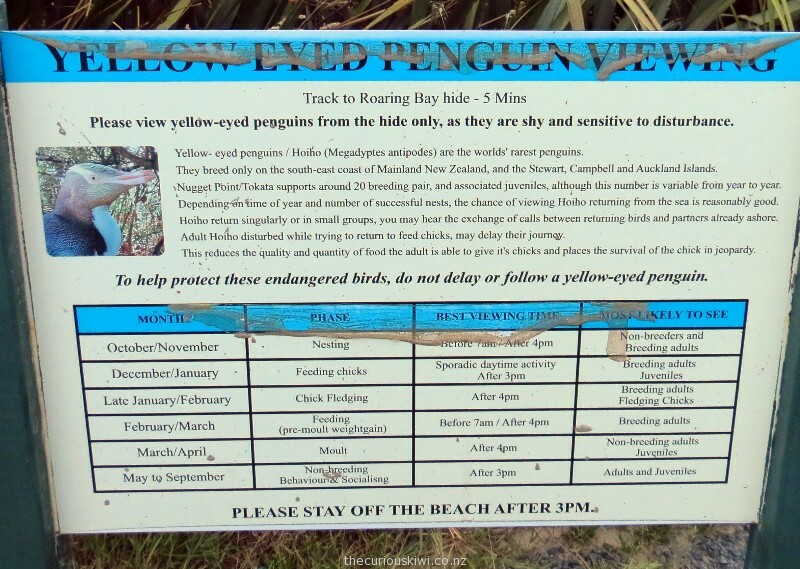 This entry was posted in Short Walks, & Wildlife, Southland, Unusual New Zealand and tagged hoiho, The Catlins, yellow eyed penguins by thecuriouskiwi. Bookmark the permalink.